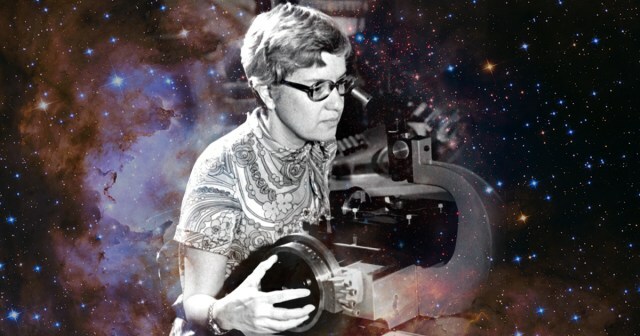 Like all of us, Vera Rubin looked up in wonder at the stars. And then she transformed our view of the universe. Buckle up, readers. Today we’re going on a speed trip through the universe. We’re starting with a salute to a very remarkable woman, someone who reached for the stars during her lifetime, and who died on Christmas at the age of 88. Her name was Vera Rubin, and she was an astronomer. I paid particular attention to her story because one of my earliest ambitions was to travel to and study distant planets. My life took a different direction, but I am still an avid reader of news stories about that field. What is dark matter? We don’t really know. It doesn’t emit light or other forms of radiation. We can’t see it or detect it with our instruments. But it has mass that affects the motion of everything else in the universe. Prof. Rubin calculated that everything, everything we humans can see or detect—all those trillions of galaxies, all of those stars and their planetary entourages—is merely five percent of what actually exists. Another 27% is dark matter—matter that does not emit light or energy. We know almost nothing else about it. The rest of what’s in the universe, Dr. Rubin speculated, is dark energy, about which we know even less. We are very small, short-lived creatures, like blind worms in a cave, struggling to comprehend our environment with our limited sensory equipment. But we do struggle. During that same 9th Century BCE, the Hindu philosopher Yajnavalkya said that the earth rotates around the sun, and not the reverse. The Greek Aristarchos declared as much in the 3rd Century BCE. However, this notion wasn’t generally accepted until after the invention of the telescope 400 years ago—and even then the Church fought back, imprisoning Galileo for daring to say that the earth is not the center of the universe. Yet to this day vast swaths of the population of the First World haven’t gotten the memo. According to a National Science Foundation survey, 34% of Europeans and 26% of Americans still believe that the sun revolves around the earth. Now, of course, with a new administration dedicated to destroying public education, denying science, and creating a fact-free political climate, we can expect those percentages to increase.